Kolkata: Traders in illiquid stocks are snapping up shares of Pilani Investment and Industries Corp. Ltd—the primary holding firm of the BK Birla group—in off-market trades even as the Delhi Stock Exchange (DSE) prepares to restart trading in the company’s shares. People are now offering up to Rs3,000 a share, according to Rajan Shah, chairman and managing director of 3A Capital Services Ltd, a firm that trades only in illiquid stocks. However, other traders in illiquid stocks, Ahmedabad-based Chimanlal Shah, who has been trading in such stocks for the last 20 years, and Mumbai-based Narottam Dharawat, quoted Rs2,000-2,400 for Pilani’s shares. According to Pilani’s latest balance sheet, the market value of its investments in listed firms alone was Rs1,770 crore as of 31 March. Given its small equity base of Rs79 crore, Pilani’s investments in listed companies alone are worth around Rs2,200 per share. However, between April and now, India’s bellwether equity index, the Sensex, has risen 65% and Pilani’s investments in listed firms are currently worth at least Rs3,000 crore. “If you consider its other investments as well, Pilani’s assets could be worth Rs4,000-4,500 crore," said Rajan Shah. Pilani’s shares are listed on DSE and the Calcutta Stock Exchange, but trading had stopped years ago because only 10% of its 7.9 million shares are widely held. Only some 2,654 private individuals held shares in Pilani, and their combined stake as of 31 March was 7.44%. DSE could restart trading in Pilani’s shares by early 2010, according to H.S. Sidhu, the exchange’s executive director and chief executive officer. “We are looking to restart trading in (shares of) 300-400 companies listed only on DSE, 300-400 companies listed on DSE and other regional exchanges, and 500 Bombay Stock Exchange and National Stock Exchange-listed companies," he added. Pilani, which was named after the town in Rajasthan that was home to the Birlas before they moved to Kolkata, used to be the holding firm for the undivided Birla group. After patriarch Ghanshyam Das Birla died in 1983, various factions of the family separated their business interests, but could not decide how to settle their equity interest in Pilani. Finally, in August 2005, after years of negotiation, B.K. Birla, chairman of the eponymous group, bought for an undisclosed sum shares held by his nephews C.K. Birla and S.K. 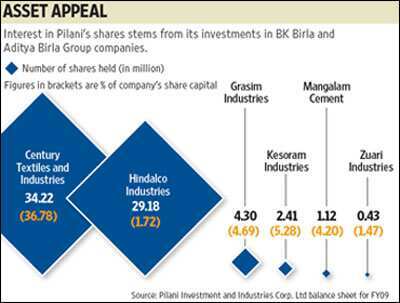 Birla and raised his stake in Pilani to 57.57%. Until then, he held 25% in the firm. Close associates of B.K. Birla hold 7-8% more of Pilani’s shares, and the MP Birla group, which is now controlled by Harsh V. Lodha, holds a little more than 25% in the firm. Asked if he was willing to acquire more shares of Pilani, B.K. Birla said: “We could if trading starts and people sell their shares. There aren’t many shares widely held." He, however, ruled out acquiring the MP Birla group’s 25% stake in Pilani. “They can’t do anything with it because we own 57-58%," he added. Lodha, who is the chairman of the MP Birla group firms, refused to comment. “There’s always been demand for Pilani’s shares from among high net-worth individuals, who can afford to wait for years, because of the intrinsic value of the company’s investments," said Rajan Shah. Besides substantial investments in BK Birla and Aditya Birla Group firms, Pilani continues to hold shares in firms such as Orient Paper and Industries Ltd, which is controlled by the CK Birla group. It also holds stakes in Sutlej Textile and Industries Ltd, SIL Investments Ltd and Zuari Industries Ltd, managed by the KK Birla group. Mint is published bt HT Media Ltd that was promoted by the KK Birla group. Pilani also owns 5.5 million equity shares and 4.73 million convertible preference shares of Rs100 each of Tata Steel Ltd.